What a glorious day Sunday turned out to be, we had great weather, delicious food and good old fashioned family fun. I always find that unplanned, spontaneous days can become some of the best days of our lives. Our Sunday started out like any other, we got up, we had breakfast, we sat in front of the tv and done nothing. Well that was until Daddy got the grass trimmer out! As soon as the kids heard that roar, they were all off out into the garden with huge smiles on their faces. Daddy was cutting the grass which meant play time for them. They seem to love it when he's outside, he's like a big child magnet that they just can't resist. Once the grass was cut and the garden was tidy, Daddy decided to put of brand new BBQ together. 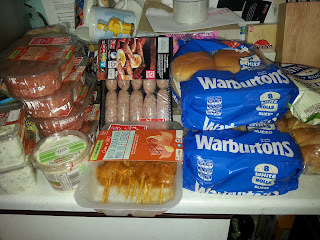 This is where the excitement began to build, we've never had our own BBQ before. We've been to other peoples and had one of those cheap disposables that never really do much. This was a big deal for us, our very first family run BBQ. With the BBQ built and the kids happily playing, we had forgotten one thing: the food but a mad dash to our local Co-Op soon fixed that. The shelves were half empty where everyone else must have had the same idea whilst the sun was out but we got enough to feed our five. I think we got enough to feed a few more too by the looks of it. Daddy was in his element doing his manly thing over by the BBQ, the kids and I played on the trampoline. The sun was shining, the wind had disappeared and the day had turned out just right. Even our cat Garfield was out lying around soaking up the sun, well as much as he could without being chased off every few minutes. The kids never did learn how to leave him alone, poor thing. We had hotdogs with proper sausages, delicious quarter pounder burgers with cheese and plenty of sauce. We had chicken tikka kebabs and potato salads, we had a feast fit for a king, well our king Daddy anyway. If I had tried to plan our day to have turned out like it did, it probably would have never happened. Like I said, it's always those unplanned spur of the moment kind of days that turn out to be the best. The kids had so much fun playing outside in the garden, Daddy looks so happy with his new toy and me, well I was so happy just being a part of it all. Our first family BBQ turned out to be a pretty good one if I do say so myself. It's the little moments in life that make it all worth while, Ryan playing with his shadow looking so pleased with himself when he thought he'd caught it. Lily actually eating a bun with a burger in it and not just the bun. Chloe relaxing and smiling whilst swinging back and forth on the swing and Ryan jumping in Daddys seat when he got up. It's these special things that make our family who we are and will stay with us forever. Last Sunday started out like every other but turned into one better than I could have ever hoped for. 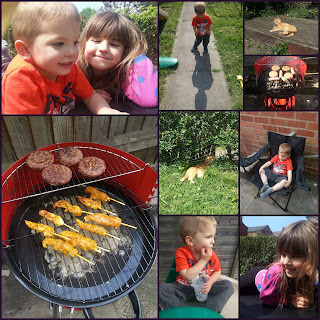 A family fun day, BBQ style. BBQs are the best - however I never get quite as much food as I would like!